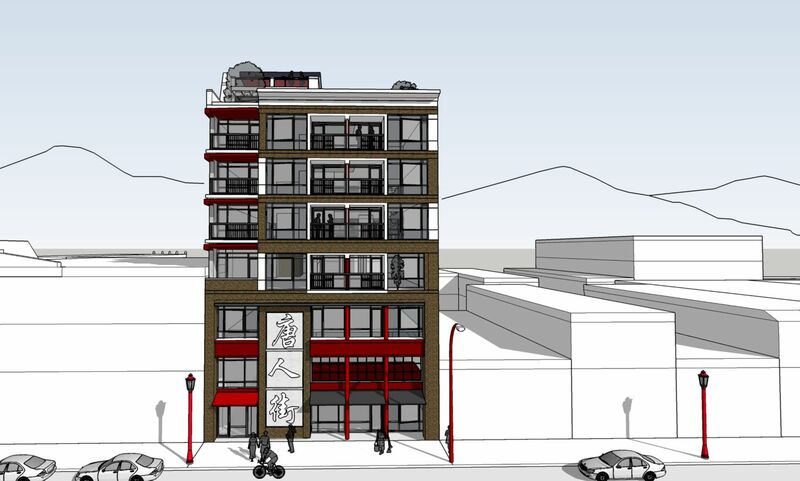 An eight-storey mixed-use retail, office and residential building is proposed for a mid-block site at 239 Keefer Street. The development, tentatively named “Keefer Gardens,” consists of two retail units — one at ground level and another in the mezzanine — two floors of office space and 29 residential units on the upper floors. It’s not clear from the development application if the units will be rental or market ownership. 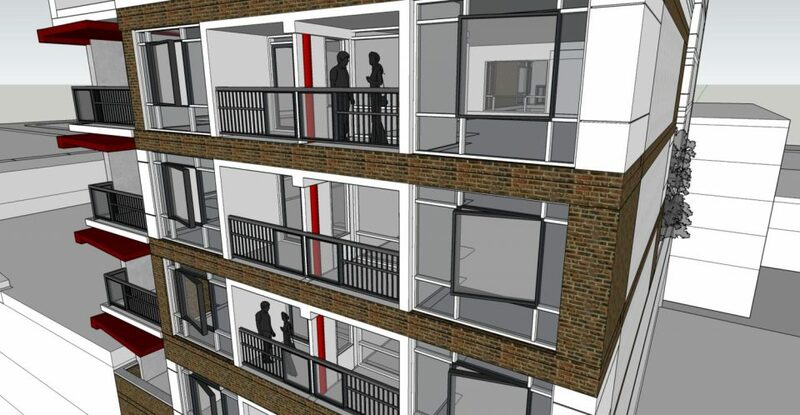 The units will range from small studio-sized one-bedroom apartments to two-bedroom townhouses measuring over 1,300 sq ft.
“The street frontage is designed with the intention of collaborating with the adjacent streetscape and wider Chinatown aesthetic,” reads the design rationale submitted by the architect. The building’s landscaping is also said to be inspired by the nearby Dr. Sun Yat-Sen Classical Chinese Garden. The building will feature a terrace on the second floor for office tenants, as well as a fourth floor “secret walled communal bamboo garden.” Seventh and eighth floor terraces will provide urban agriculture spaces and amenity space. 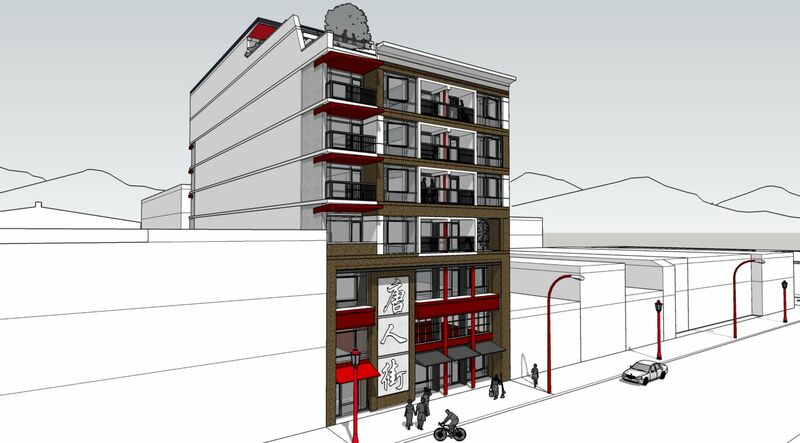 “We feel this proposal is a successful balancing of needs and challenges in Chinatown, and will help to revitalize the conversation and approach to the future of this dynamic and diverse neighbourhood,” says the architect. View of 239 Keefer Street market residential units. 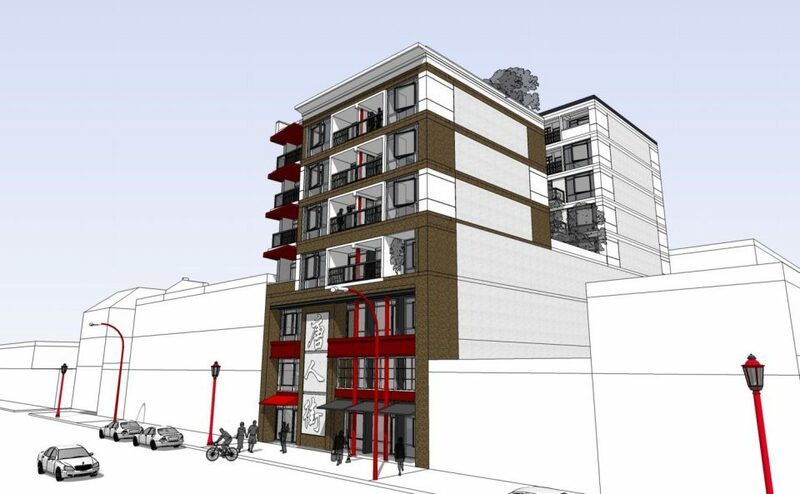 Rendering of proposed building at 239 Keefer Street. The building goes to the Development Permit Board on October 30, 2017.